What happens when the global market for media tablets shows signs of saturation in key regions? The analyst focus should shift toward the progressive software applications for these mobile devices. Meanwhile, industry analysts will continue to address the apparent market volatility, by adjusting their shipment forecasts. 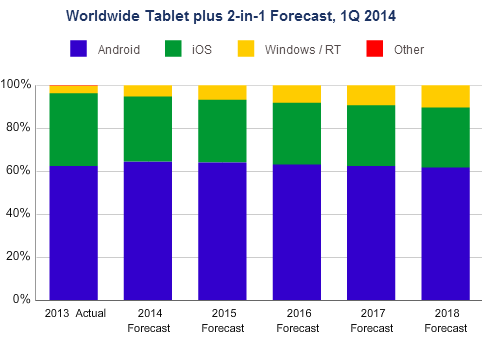 Based on a greater decline in demand than predicted in the first quarter -- and real concerns that vendors will face additional market challenges the rest of the year -- International Data Corporation (IDC) has lowered its 2014 worldwide tablet plus 2-in-1 forecast to 245.4 million units. That's down from the previous forecast of 260.9 million units. The new forecast represents a 12.1 percent year-over-year growth rate, which is notably lower than the 51.8 percent year-over-year growth of 2013. "Two major issues are causing the tablet market to slow down. First, consumers are keeping their tablets, especially higher-cost models from major vendors (like Apple), far longer than originally anticipated. And when they do buy a new one they are often passing their existing tablet off to another member of the family," said Tom Mainelli, Program vice president at IDC. Second, according to Mainelli, the rise of phablets -- smartphones with 5.5-inch and larger screens -- are causing many people to second-guess tablet purchases as the larger screens on these phones are often adequate for tasks once reserved for tablets. In the past year alone, the phablet share of smartphone shipments has more than doubled -- from 4.3 percent in the first quarter of 2013 to 10.5 percent in the first quarter of this year, representing 30.1 million units shipped. As large phones clearly impact near-term tablet growth, IDC expects the market to rebound by shifting its focus back toward larger-screened devices. Products with larger screens are expected to play a greater role in the market going forward. The trend toward larger tablet screens will mark a welcome change for most vendors as the average selling price for these devices will remain roughly 50 percent higher than the average sub-8-inch device. Microsoft hopes that it can benefit from this shift, as the share for Windows-based devices is forecast to double between now and 2018.